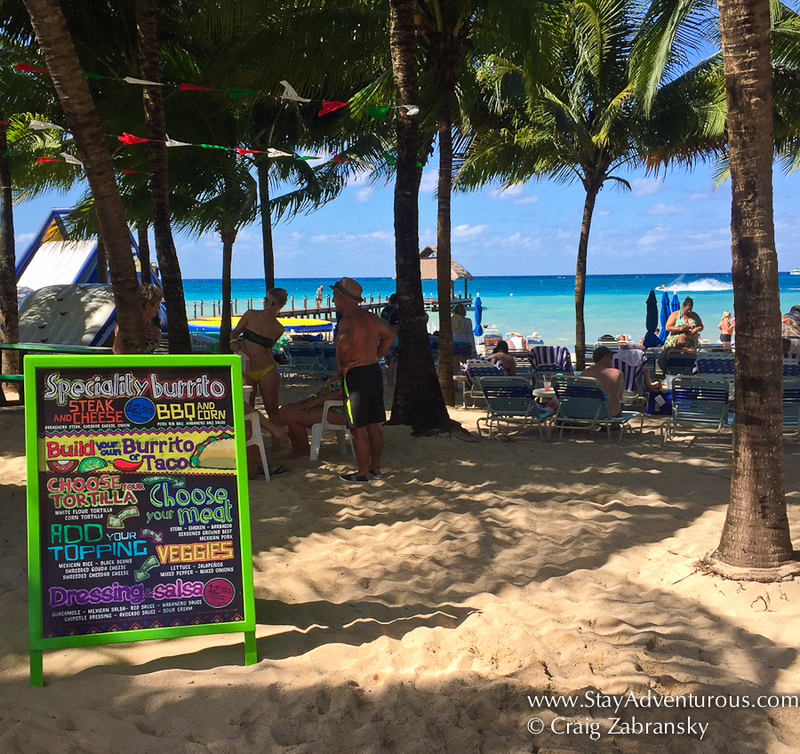 One of the biggest decisions in Cozumel, the Mexico Caribbean destination island paradise is which beach club to visit when you plan to take a beach day. 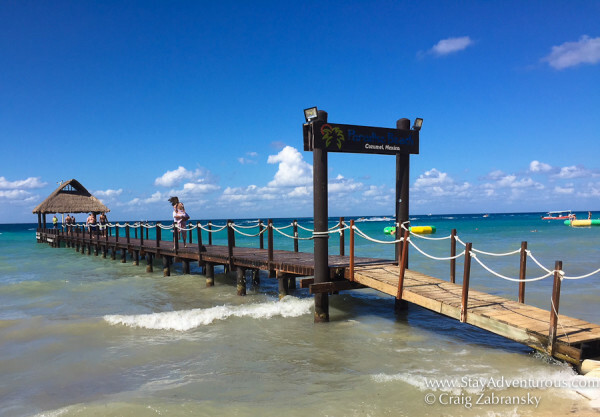 On my last visit when sailing on the NCL Getaway, I debated it for a while (over a cerveza) and eventually selected Paradise Beach. There are plenty of options. Some names you may recognize (I recall some from my spring break days) and others can come recommended from fellow cruise passengers and / or locals. Some are all inclusive (such as Nachi Cocum where my prior time on the island) and others that only charge a small entrance fee with an a la carte minimum spend such as at Paradise Beach. But largely the beaches themselves are the similar and many essentially share the same sands and sea as neighbors. Of course, people have opinions on the better value or better beach, but the two I visited on my last two shore excursion in Cozumel I can easily recommend depending on what you want on your beach day. Paradise Beach was selected simply because we didn’t plan to spend an entire day there, just a few hours, in order to leave time to explore and walk around San Miguel, the main town (city) on the island of Cozumel. 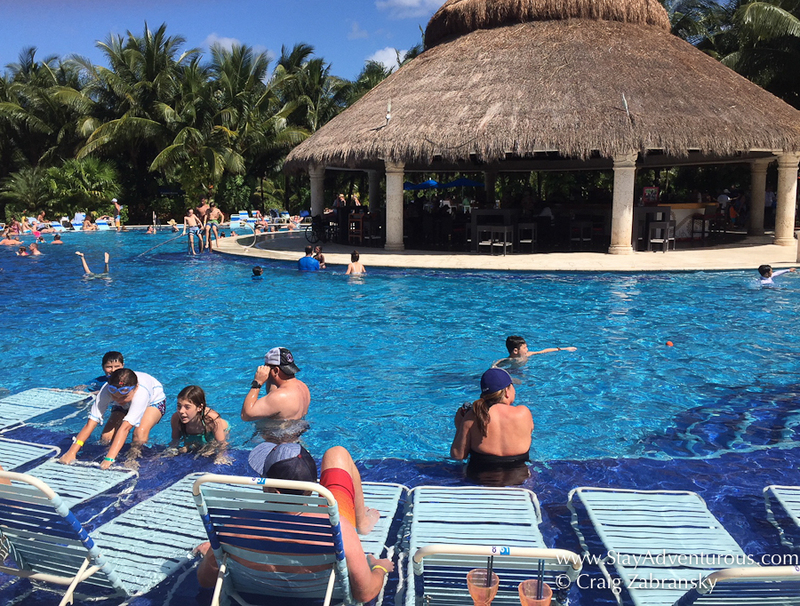 Plus, with the abuse of the alcohol package (and bountiful food options) on board the ship past for the prior four days I knew I would not be drinking too much (although I did partake in a few cevrvezas of course – it’s Mexico). Upon arrival to port and after a negotiated taxi ride of ~$20, we paid the $3 entrance fee with the promise to spend at least $10 per person. Inside, plenty of lounge chairs still were empty as we decided to head to the beach relatively early after minimal browsing in the cruise port shops. It is important to note, we certainly didn’t rush here yet still found plenty of seating options. However the open chairs would eventually fill up and the place would get quite crowded as other cruise lines passengers from the other seven ships in town arrived in force. At one point I believed the water sports (trampoline) and equipment was also included, but eventually I was asked to “bounce off” and buy a wristband to use the equipment at $18 for the day. 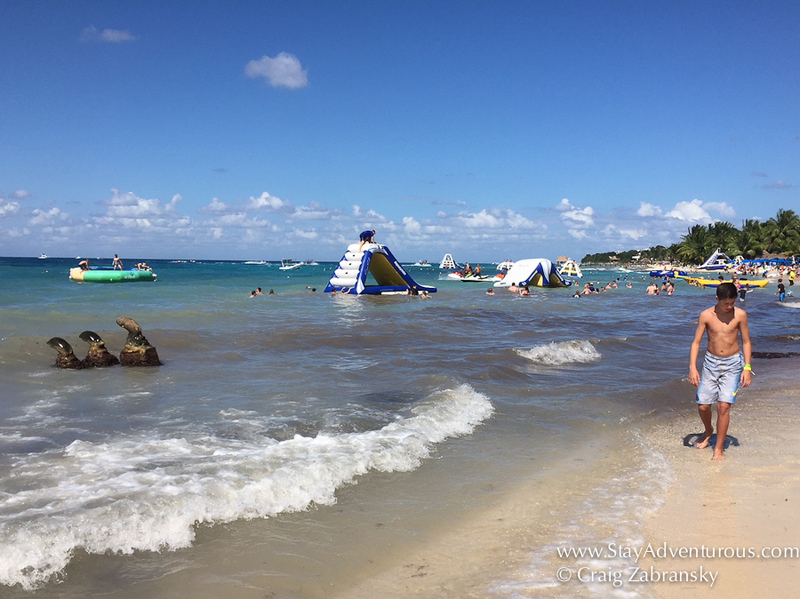 It is called a “fun-pass” and included all watersports including kayaks. Oooops. After beach time, I even enjoyed some pool lounging before heading out. The pool remains the largest heated pool on the island and is set to 82 degrees Fahrenheit (or 28 Celsius ) In all, the place provided good service and access to the beach and pool along with lounge chairs and shade. 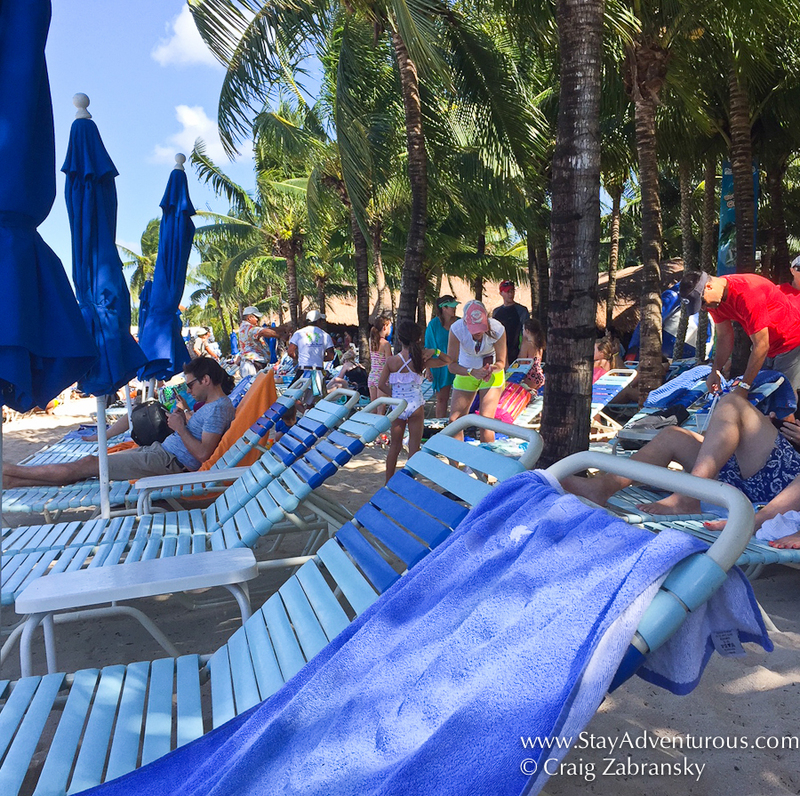 Paradise Beach is a certainly a good value spot and to consider on your Cozumel beach excursion if you don’t mind the eventual crowds. Groups need to arrive earlier. 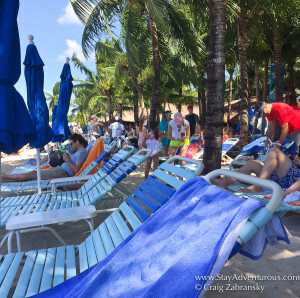 I noticed plenty of big groups, whether large family holidays or even friends all taking a cruise together, searching for chairs close to each other. Definitely make sure you arrive earlier if you all want to “lounge” near each other. Good for Family Travel. The a-la carte option works well for family travel on a budget. Yet Paradise Beach does get crowded and can be a fiesta. You will definitely make sure you do keep on eye your children, especially if they are not strong swimmers. The water did get deep and crowded when heading out to the watersports (trampoline). So if you have a big family this may not be the relaxing beach day you envision. Leave with time to spare. Although it is less than 5 miles from the cruise piers, remember all the fellow beach-goers will also need to head back all on the same single road to town. That translates to thousands of people in taxis. Traffic may slow you down some. So don’t lose track of too much time and miss one your Cozumel all-aboard call if you visit during your cruise stay. Happy Beach Thursday! The winter series returns in 2018 with an 8 part series of beach posts. See all the details for the 2018 season and all the 50 plus beaches visited through the years on the Beach Thursday Page. Additionally, this post is part of the Mexican March Madness series designed to educate, enlighten and entertain readers focusing on Mexico every March. 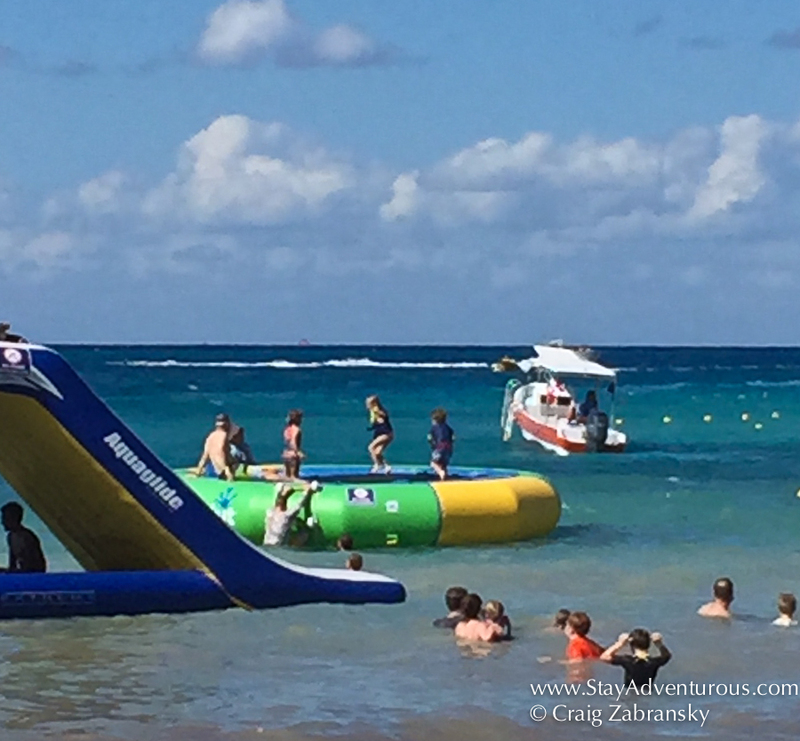 Follow along in 2018 as we focus the diversity of Mexico Travel available to the traveler and tourist alike. Viva Mexico! Wow! This looks so beautiful. Looks like the perfect getaway for spring break. wow! place looks great for a get away trip! Definitely could use this article as a guide to planning my next trip. Thanks! This destination looks amazing! I am trying to plan an all inclusive trip for December with some of my friends and we have yet to pick a destination….this is definitely going to be a location I am going to suggest! Beautiful!! I’ve always wanted to visit a tropical place, now you convinced me even more to do so! I’ll have to put this guide to use, thanks! The water sports look so fun and the food truck sounds delicious! You can never run out of amazing activities to experience in a beautiful destination! The beach/ocean looks beautiful in your pictures. I’d love to take a trip there. Love your pictures looks like you had so much fun there! Mexico is on my bucket list to go to!